Home chemical safety must be taken seriously. We use toxins frequently in our day-to-day lives. Unfortunately, many people keep hazardous cleaning supplies in the cabinet below the kitchen sink. Dangerous bathroom products are kept in a low cabinet. Both places make it easy for children to explore and discover poisons. That's why it is extremely important for home daycare providers to be diligent about children's safety. Poisonings can and do happen. All household toxins must be locked up. In a home daycare setting involving several children, you honestly cannot be everywhere at all times. Lock up every potential danger; the higher the cabinet, the better. If you haven't done so already, please place the number for poison control next to your phone or add it to your contacts in your cell phone. 1-800-222-1222. Really... do it now while the thought is in your mind. Should you ever need to call, Poison Control will ask for specific information. You'll need to know the victims age and weight, and the time of the poison exposure. You should also have the poison container on hand when you call. Have Syrup of Ipecac in your First Aid Kit. Do not, however, EVER give this to anyone without the consent of Poison Control or a physician. Depending on the poison, inducing vomiting may make the initial injury worse. Home chemical safety starts by going through every room in your home. The following list is by no means complete, but contains common household toxins that should be locked up and kept away from children. Walk room to room and make sure that anything poisonous is locked up. Lock up any and all dangerous products. 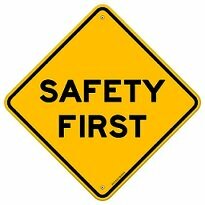 Make sure there are safety locks on any cabinets containing hazardous items. Placing these items in high cabinets makes them harder for children to get to. Remember that children can get into drawers just as easily as cabinets. Install safety latches on drawers also. Clean out both cabinets and drawers on a regular basis. Home chemical safety means you should discard what is no longer needed. Remove outdated prescriptions. Do not place toxins in open trash containers. Keep all products in their original containers. The labels contain important first aid information. Follow the safety labels on products. Buy products with child resistant caps. Remember, however, that child RESISTANT does not mean child PROOF. Make sure caps are tightly closed after each use. Do not take medication in front of children or refer to medicine as candy. Remember that children will imitate adults. When making your home safe, do not forget about the garage, shed, or pool area. Hazardous substances are everywhere. Try not to use any cleaning products during daycare hours. If you must use something toxic, be aware of where the children are. Do not set the container down and turn away. Children are incredibly fast. Place the toxin back in a locked cabinet the moment you are finished. Home chemical safety is just one area of daycare safety. Learn all you can to keep all the children as safe as possible.